Volunteers at the Ewa Beach site. Directions: Take H1 to Exit 5A, ‘Ewa Beach (Fort Weaver Road), and continue on the main road through the business and residential areas. The ‘Ewa Beach site is located directly across from the ‘Ewa Beach Golf Club. The beach site is located approximately 200 yards away from the road. Puʻuloa Rifle Range is at the end of the road. Parking: Safe parking lot is available with approximately 50-60 stalls. Look for white cement markers around the parking area. Facilities: Public restrooms and covered picnic areas are available. Little shade and no drinking water available. Handicapped accessible. Comments: The site is at sea level, which may affect visibility. Binoculars are recommended. Bathymetry: The site’s coastal water falls within a restricted zone of the US Navy, Pearl Harbor. The land is very flat. This site allows for a great view of the coastal area due to its shallow coastal waters extending as far out as 3,750 yards from shore. The shallow reef bottom is a combination of hard and soft bottoms with sand and limestone outcrops and boulders. Coastal waters are very shallow with a depth of 2 fathoms stretching 1 mile seaward. One of the Ko ʻOlina lagoons. Directions: Take H1 West towards Waianae. Go past the Makakilo/Barbers Point exit. H1 will turn into Farrington Highway. Turn off at the Ko ʻOlina exit and head towards the hotel. Paradise Cove will be on your right. Stop at the first guard station; tell them you are going to public beach. Site is usually located at fourth lagoon. There is a short 5-minute walk to site area. Parking: Safe parking is available at the lagoon. Please park only in the free, public parking area at Lagoon 4, parking elsewhere, including the marina lot, requires the purchase of a parking pass. Facilities: Public restrooms, telephones, and drinking water are available at this site. Limited shade. Handicapped accessibile. Bathymetry: The shallow reef here (3 fathoms) includes a complex reef bottom with a mixture of limestone boulders and outcrops, as well as hard bottom and rubble. Further offshore, at approximately 3-10 fathoms, the bottom is consolidated, grooved limestone with sand in the grooves. Ocean bottom is soft with a strip of limestone sand bottom extending about 875 feet parallel to the shoreline. The site at Maʻili Point affords good visibility. Directions: Take H1 West to end and continue on Farrington Highway for approximately four miles past Kahe Power Plant. Slow down and turn right 7 tenths of a mile after Hakimo Road. Site is the next right on the mountain side at the Board of Water Supply. Go through the Civil Defense iron gate and up the paved road to park. Site is located at the bunkers (tunnel). NOTE: there is a divider wall after Hakimo Road. Stay on the mountain side of the barrier and slow down to prepare for the sharp right turn. Parking: No parking on highway. Parking available at Civil Defense site. Facilities: Public restrooms and partial shade are available. Drinking water and public telephones are not available. Not handicapped accessible. Comments: Access to this area requires special permission from the Civil Defense. Sanctuary will obtain permission prior to count. Site accessed by a paved road. Beautiful location with restricted access. Site can get a little windy, dress accordingly. Great viewing area. Historical World War II gun implacement area. Bunkers still stand but access to tunnels is not allowed. No animals, no picking fruit or flowers, no mountain climbing, and no photography of area. Bathymetry: The surveying site is located on state land. There is a rocky coral reef area extending about 50 yards nearshore. Sometimes this rocky coral reef area is uncovered depending on wave action. There are at least 10 large rocks in the water near the coast located in less than 2 fathoms that are also uncovered depending on wave action. Nearshore ocean bottom is hard basaltic bottom. The bottom becomes consolidated limestone with some reef slope areas further away from shore with depths starting at 3 fathoms. The Makua site is located adjacent to the main road. Directions: Follow Farrington Highway past Makua Beach Park. Makua Cave is located approximately 2 miles up the road on the left (makai) next to the Kaneana sign. Parking: An unpaved parking lot is located right off the road on the makai (ocean) side. Facilities: No public facilities available. Shade available. Handicapped accessible. Bathymetry: The vantage point is located on state land. The shoreline is mostly limestone with low-lying outcrops. Nearshore and offshore bottoms are mostly hard bottom and include two independent shallow reef sand bottoms west of the Makua Cave. The hard bottom encompasses very little ocean floor beyond 10 fathoms and 0.6 miles from the site. The West Kaʻena site offers a large expanse of sandy beach and regular sightings of playful dolphins. Directions: Take H1 west to Farrington Highway to the end. Parking: Parking is available near restrooms. Facilities: Public facilities and drinking water are available at the site. Phones and shade are not available and cellular phone reception is poor. Handicapped accessible. Comments: Count is conducted on the beach side of the road. Bathymetry: This site includes the Kaʻena Point Natural Area Reserve. The ocean bottom here consists mainly of hard bottom with very few patches of sand pockets both found as deep as 10 fathoms and as far out as 0.3 miles from shore. Directions: Take H1 west towards Waiʻanae then connect to H2 North Wahiawa/Schofield. Continue straight Schofield-bound and eventually the freeway will slope down, merging onto a road (99 North). With Schofield Barracks on your left, proceed toward Waiʻalua. At the fork in the road, stay left heading toward Mokuleʻia. At the end of the road, look for a large sign Point Light House, U.S. Coast Guard, Natural Area Reserve (NAR). Parking: Parking is available in the lot just before the red and white gate. For those with 4WD vehicles, you can loop past the gate onto Kaʻena Point Road (unpaved) and park closer to the shore. Facilities: No public facilities are available. Comments: Site access requires an easy 3-mile hike from the paved road. Bathymetry: The vantage point here is located on the Kaʻena Military Reservation. The coastal bottom here is abundant in limestone with random areas of reef slopes. Approximately 375 feet offshore, the bottom drops off from 2 to10 fathoms. Volunteers at Mokuleʻia use a little help to spot the whales. Directions: Take H1 west towards Waiʻanae then connect to H2 North Wahiawa/Schofield. Continue straight Schofield-bound and eventually the freeway will slope down, merging onto a road (99 North). With Schofield Barracks on your left, proceed toward Waiʻalua. At the fork in the road, stay left heading toward Mokuleʻia. The beach park will be on the right across from Dillingham Air Force Base. Facilities: Portable restrooms and handicapped access are available. Public telephones, drinking water and shade are not available. Comments: Many parachutists land in the park or on the highway. Bathymetry: Lying perpendicular to the shoreline there is a coral reef approximately 1,000 feet in length. The coastal water depth is very shallow ranging from 1-2 fathoms and extending as far as 0.3 miles directly north of the beach park. Nearshore are small patches of hard bottom composition, which include a mixture of limestone boulders, outcrops, sand, and rubble. The ocean bottom is mainly limestone. There is also diverse marine life within this range. 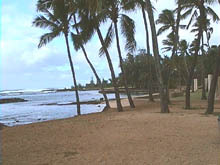 View of Puaʻena Point (just beyond the coconut trees) from Haleʻiwa Beach Park. Directions: Take H1 towards Waiʻanae. Turn off at H2 and go towards Mililani/Wahiawa. Take the Wahiawa exit, which puts you on Kamehameha Highway going north. Stay on Kamehameha Highway until you get to the second traffic light by Haleʻiwa. Turn left at the light, then take a quick first right at Kahalewai Place next to the field at Haleʻiwa Beach Park. Park at the end of the street, and walk around the closed gate, following the path to the point. Parking: Park on Kahalewai Place or at Haleʻiwa Beach Park. Facilities: Shade available. 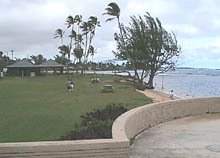 Public restrooms, phone, and drinking water available at Haleʻiwa Beach Park, a 10 minute walk (one way) from the site. No beach access. Not handicapped accessible. Comments: Kahalewai Place street sign is not visible. Great family site. **Note: access to site requires a 10-15 minute hike. Bathymetry: Bernice Pauahi Bishop Estate privately owns a portion of the south shore of Puaʻena Point. About 450 feet from the shoreline and at a depth of 2 fathoms, the bottom composition is predominantly limestone. There is also diverse marine life up to 10 fathoms and 0.2 miles from the northwest shore of this site. Volunteers at the popular diving and snorkeling spot known as Shark's Cove. Directions: Take H1 towards Waianae. Turn off at H2 and go towards Mililani/Wahiawa. Take the Wahiawa exit, which puts you on Kamehameha Highway going north. Stay on Kamehameha Highway until you pass Foodland on the right. 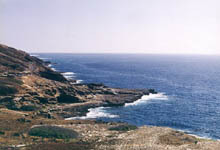 Sharks Cove is the rocky area off to the right as you face the ocean. Pupukea Beach Park will be on the left. Parking: Public restrooms, drinking water, and shade are available. No public telephones. Handicapped accessible. Facilities: Public restrooms, drinking water, picnic tables, and shade are available. Handicapped accessible. Comments: May want to bring some bug repellent. Bathymetry: This site is located within the protective zone of the Department of Land and Natural Resources (DLNR). The bottom here is made up of a complex shallow reef. This reef is comprised of hard, but mostly soft bottom types. Approximately 150 feet directly north of the cove’s shoreline, there is a wedge of scattered outcrops or boulders in a sandy bottom. There is very little change in bottom composition northeast about 0.1 miles from the shoreline. A sand patch can be found at a depth of 3 fathoms. Extending about 0.3 miles beyond the Cove, the ocean depth drops to approximately 10 fathoms. This Ocean Count site provides a great opportunity for whale observers.. 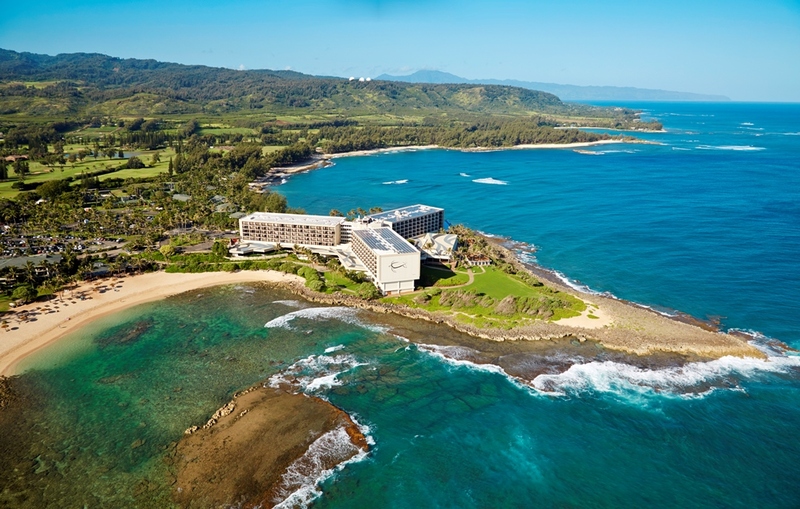 Directions: Site is located at Turtle Bay Resort north of Kahuku. Site area is near wedding pavilion at Kuʻilima Pt. Facilities: Public restrooms, phones, drinking water, and shade are available. Handicapped accessible. Bathymetry: The nearshore bottom at this site drops off to approximately 1 fathom and extends 100 feet from the shoreline. The bottom then drops off to 5 fathoms approximately 0.38 miles (2,000 feet) from the shoreline. Nearshore bottom is dense limestone with a smooth, pavement-like surface. 0.38 miles from the shoreline the bottom composition is uniformly limestone with some reef slope. Laʻie Point is a bare and rocky site, but has a good elevation and sweeping views of the ocean. Directions: Head towards the Laʻie Shopping Center on Kamehameha Highway in Laʻie. Directly across from the L&L Drive-In is Anemoku Street. Take this street to the top of the hill, and then turn right on Naupaka Street. The point is at the end of the street. Parking: Ample parking is available at the site. Facilities: No public facilities or shaded areas are available. Handicapped accessible. Comments: Laʻie Point juts out into the ocean further than any other point of land on Oʻahu and perhaps even the neighbor islands. It offers a magnificent view of the coastline on both the north and south side, including one of the best views of the Koʻolau Mountains. It may get a bit windy-- be prepared. Bathymetry: Bottom composition consists of sand and shells beyond a depth of 10 fathoms with rocky bottom on the west side of the point. Approximately 500 yards from the tip of the peninsula, the ocean depth drops suddenly to 10 fathoms. View of Hauʻula Park from the concrete observation deck near the beach. Directions: Take Kamehameha Highway to Hau’ula. This site is at Hau‘ula Beach Park, located across the street from 7-Eleven and just south of the Polynesian Cultural Center. Parking: Parking is available at site. Comments: The site is located at a nice comfortable, beach park. Visibility is limited due to low elevation--binoculars are recommended. Bathymetry: The coral reef offshore is approximately 0.3 miles in length and 0.2 miles from the shoreline. Bottom composition is mostly sand at a depth of 10 fathoms and silt at 50 fathoms. On the west end, the ocean bottom consists of cobbles or small boulders. The rest of the ocean bottom within 1 fathom consists of a mixture of hard and soft bottom types. There are some scattered boulders less than 1 fathom on the east side of this site. Approximately 825 yards from the shoreline the depth is 3 fathoms. The ocean depth reaches 10 fathoms approximately 1,600 yards from shore. The bunkers at Kualoa Ranch affords excellent visibility, but no public facilities. (Chinaman’s Hat). The site is located at the bunkers about 1 mile up dirt road from the parking lot. Parking: Parking is available approximately 1 mile from site at Kualoa Ranch lot. Ranch staff will provide a van to shuttle volunteers to the site. Some volunteers may be able to carpool to the site depending on parking space. Facilities: No public restrooms, telephones, or drinking water are available at the site. It is possible to drive to the restrooms. Not handicapped accessible. Comments: Viewing site is located at the WWII bunkers on the cliff above Kamehameha Highway at Kanehoalani Range. Excellent viewing position. Bathymetry: Approximately 475 yards from shore, the depth drops off to 6 fathoms. The nautical chart depth contour maximum is up to 60 fathoms. Its ocean bottom is shallow and consisting mainly of sand, boulders, and limestone outcrops. 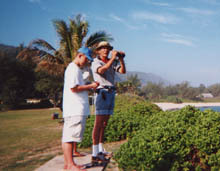 Volunteers at Pyramid Rock on the Kaneʻohe Marine Corps Base. Directions: Take H3 Kaneʻohe-bound to the main gate of Kaneʻohe Marine Corps Base. Take a left at the second traffic light (Mokapu Street). Cross the main airstrip and continue to the end of the road. Turn right into the dirt parking lot and proceed to the far right end of the rock wall. Parking: Parking is adjacent to site in an unpaved lot. Facilities: Public restrooms (portable toilets), and shaded areas are available at site. An Emergency call box is also available. Not handicapped accessible. Comments: Military access is required to get onto base. Count may be conducted either from the beach or lighthouse depending on access availability. Lighthouse requires climbing a steep stairway (~60 steps) to get to top. Sunblock and insect repellent are suggested. Bathymetry: The ocean bottom type is hard. Nearshore depth is approximately 18 fathoms, deepening to 30 fathoms approximately 200 feet from shore. Breakers are located beyond 18 fathoms. Directions: Take H3 Kaneʻohe-bound to the main gate of Kaneohe Marine Corps Base. Turn right at the second traffic light and left at the next light (by McDonalds & gas station). Take the third right and follow the road to the end. Parking: Park on the road by the rifle ranges. Facilities: No public facilities or shade are available at site. Restrooms are a short drive away. Handicapped accessible. Comments: No protection from the elements, bring protection (i.e. water, sunscreen, hat, etc.) Site has a high vantage point which offers good viewing. Military access is required to get onto base. Bathymetry: The intertidal area east of Mokapu Point is made up of coral and volcanic rock. The ocean bottom composition nearshore is mostly coral and coralline algae. The bottom is sandy with submerged massive boulders beyond 10 fathoms. Approximately 400 feet from the east shore of Mokapu Point, the depth is 3 fathoms. Directions: From H3: Take the H3 Highway towards Kaneʻohe. Take the Kaneʻohe Bay Drive exit and follow Kaneʻohe Bay Drive to the right. Continue straight down Kalaheo Avenue. You will see Kailua Beach on your left. At the stop sign turn left and as you go up the hill you will be entering Lanikai. From Pali: Take Pali Highway Kailua-bound. Go through Kailua town. The road will end in a T. Turn right and follow the road past Kailua Beach Park (on your left). At the stop sign turn left and as you go up the hill you will be entering Lanikai. 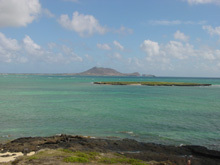 The site is located at the Lanikai Lookout. Parking: Parking is available in an unpaved lot behind the bus stop across the street from the lookout. Facilities: Restrooms, drinking water, and shade are available nearby at Kailua Beach Park. Handicapped accessible. Comments: Good viewing site. Binoculars are recommended. Bathymetry: The coastline at this site is made up primarily of volcanic rock. Coastal features include patches of coral reef at 3 fathoms and 1,200 yards offshore. Approximately 2,400 yards from shore, the depth is 10 fathoms. The bottom composition is made up of coral, coralline algae, and sand. The offshore bottom is mostly a hard sandy bottom. Volunteers at Waimanalo opt to take advantage of the shade. Directions: Travel east on Kalanianaʻole Highway past Makapuʻu Point. The entrance to Waimanalo Beach Park will be on the right. Comments: The site is not elevated above shoreline so whale watching may be a little more difficult. Binoculars are recommended. Ideal for student groups. Bathymetry: Ocean depth here is very shallow. It ranges from 1 fathom nearshore to 3 fathoms approximately 400 yards from the shoreline. Bottom composition is sandy and includes coral and coralline algae. Large coral reefs are not very abundant in this coastal area. There are approximately 2 patches of coral reef. NOTE: This site is reserved for student groups. Please contact the sanctuary office to inquire about group registration. The easy 30-minute hike to this site is well worth it for the spectacular views of the ocean. Directions: Travel east on Kalanianaʻole Highway towards Makapuʻu Point. Site is approximately 4.5 miles from Koko Marina Shopping Center. Look for trail entrance on the right hand side of the road before the scenic lookouts. A black gate indicates the start of the trail. Parking: A paved parking lot is available off the main road. Comments: A 1-1/2 mile hike (approx. 30-45 minutes) up a 30 degree grade is required to get to the site. The semi-paved trail is at a moderate slope. Windy conditions at the top. This elevated site is ideal for whale watching. Bring water and sunscreen. Bathymetry: This site’s nearshore depth is approximately 3 fathoms and nearshore bottom composition is volcanic rock. The ocean depth at this site extends beyond 100 fathoms. The ocean bottom composition is hard and rocky (mainly basalt or limestone) and ranges 6-10 fathoms. Volunteers at the Halona Blowhole kick back between whale sightings. Directions: From town: Travel east on Kalaniana‘ole Highway towards Hanauma Bay. Halona Blowhole is the second lookout area past Hanauma Bay. From Kailua: Travel south on Kalanianaʻole Highway through Waimanalo past Sea Life Park and Makapʻu Point. Site is the large lookout just past Sandy Beach. Facilities: No public facilities are available. No shade. Handicapped accessible. Nearest public restrooms located at Sandy Beach. Comments: Easily accessible from the main road, high vantage point for viewing. Can be very hot or windy, dress accordingly. Bathymetry: The rocky bottom ocean floor of this site extends from the shore to approximately 3 fathoms. Bottom composition includes some coral, coralline algae, and sand. View of Lanaʻi Lookout, a popular whale watching spot. Directions: Travel east on Kalanianaʻole Highway towards Makapuʻu Point. Site is located between Hanauma Bay and Halona Blowhole. Look for the first parking lot after the Koko Head Rifle Range. Parking: Limited parking is available at the lookout parking lot. Parking is also available on Kalanianaʻole Highway. Facilities: No public facilities are available at site. No shade. Comments: Very bare and rocky site, but excellent for whale watching. Easy access from the road and can accommodate large groups of people. Bathymetry: Nearshore depth is approximately 6 fathoms. Ocean bottom is predominantly a solid or hard bottom. The shoreline is rocky and mainly composed of volcanic rock. Hanauma Bay is a world-renown conservation district known for its abundance of marine life. Directions: Travel east on Kalanianaʻole Highway towards Makapuʻu Point. Entrance to Hanauma Bay will be on the right, not far from Koko Marina Shopping Center. Participants will meet in the upper park picnic area. Parking: Ample parking is available in the Hanauma Bay lot ($1 per vehicle). Facilities: Public restrooms and drinking water are available near the parking lot. No shade available. Not handicapped accessible. Comments: Whale watching is conducted from Palea Point. A short hike with dirt and loose rock terrain is required (~20 minutes). Bathymetry: Hanauma Bay is commonly known for its diverse aquatic population. The surrounding ocean bottom composition is hard rock bottom. The cliffs at Portlock, though windy, offer scenic views of the ocean. Directions: Travel east on Kalanianaʻole Highway towards Hawaii Kai. Turn right onto Lunalilo Home Road. Turn left onto Poʻipū Drive. Stay on Poʻipū Drive and turn left onto Lumahai Street. Right before Lumahai Street comes to a dead end, on the right side will be a blue sign on the right-hand side (slightly obscure) marking the public access walkway to the point. Facilities: No public restrooms, telephones, or drinking water are available at site. Not handicapped accessible. Comments: Advised caution in choosing this site as access can be difficult. A short hike is required to get to the site. Follow a rather steep public access trail that runs between the homes. The site is a bare and steep (in some places) area that runs along the cliff faces of Portlock and may be slippery when wet. Views are excellent for whale watching, though the area tends to be windy. There is heavy boat traffic. Site not recommended for children under the age of 13 and parental supervision is required to ensure safety. Bathymetry: This site is mainly steep volcanic rock. Its nearshore depth is approximately 3 fathoms with a bottom composition of coral, coralline algae, and sand. Gravel is found beyond 20 fathoms. 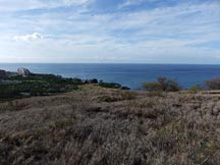 The Diamond Head site is very popular for its convenient location and good elevation. Directions: Heading east on Diamond Head Road, look for the second lookout after the lighthouse. Parking: Street parking is available along Diamond Head Road (stalls fill up quickly). Facilities: Public telephones are available. No restrooms, water, or shade. Handicapped accessible. Comments: Convenient access to the site. Excellent site for whale watching due to its elevation, though binoculars are recommended. Very hot and humid, come prepared. Bathymetry: The shoreline here is a sandy beach. There are several big patches (~6) of coral reef in the viewing vicinity. The shallow waters contain large rocks at a depth of 1 fathom. The ocean bottom is composed of coral and coralline. The depth approximately 800 yards from shore is 3 fathoms. The shallow bottom nearshore is a hard bottom type. This hard bottom type is a mixture of sand, rubble, limestone outcrops, and boulders. Magic Island is a popular spot for beach-goers, fishers, and surfers. Directions: Site is located across from Ala Moana Shopping Center. Walk out as far as possible on the walkway, then proceed to the rocky breakers (rock wall jetty). Parking: A paved parking lot is available but is often crowded. Comments: Good family area for viewing, however binoculars are recommended. There are plenty of ocean activities to watch in addition to whales. Bathymetry: The foreshore here is flat and made up of sandy material. The depth here is no more than 1 fathom. The outer boundary of Magic Island is a man-made shore that may be basalt blue rock. From this outer boundary the ocean depth ranges from 3 to 200 fathoms. There is a vast amount of coral reef found within the waters on the west and east side of this site, however there are no reefs directly in front of the site. The shallow ocean bottom past the outer boundaries is made up of limestone. 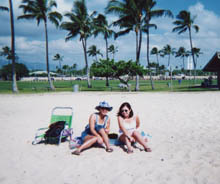 The Kakaʻako site has excellent facilities and is a popular spot for family picnics. Directions: Located off of Ala Moana Boulevard. Turn makai (toward the ocean) on ʻOhe Street and proceed to the parking lot. Parking: Paved parking lot is available. Comments: Good family area for viewing. Bathymetry: Extending out to 650 yards from the sea wall, the ocean depth is approximately 3 fathoms. The make-up of the nearshore ocean bottom is mainly limestone, however the majority of the offshore ocean bottom is hard bottom. Directions: Take H1 West towards Wainae. Go past the Makakilo/Barbers Point exit. H1 will turn into Farrington Highway. Pass the Ko ʻOlina exit and turn right into the Waimanalo Gulch Sanitary Landfill. Stop at the office and complete the site liability waiver. We will proceed to the viewing location as a group in your own vehicle. Parking: Parking is available up a mild hill on a smooth but unpaved road. Facilities: Public restrooms (portable), drinking water, and shaded areas are available. Comments: Please arrive at the site by 7:30 am so that we can complete the necessary waiver and go to the lookout as a group. Good viewing site with great perspective. There is no smoking and no pets allowed at this site. 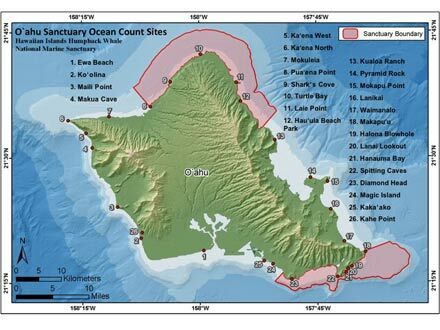 The above 26 sites are approved sites for the annual Sanctuary Ocean Count on O'ahu. Occasionally other sites may be available. The Ocean Count Coordinator will be able to provide information on additional sites if they are available. Only those sites that are approved by the Ocean Count Coordinator will be included in the annual Sanctuary Ocean Count report.